Last week we looked at phonetics and phonology and how you can play around with them to come up with your own variant of an existing language. 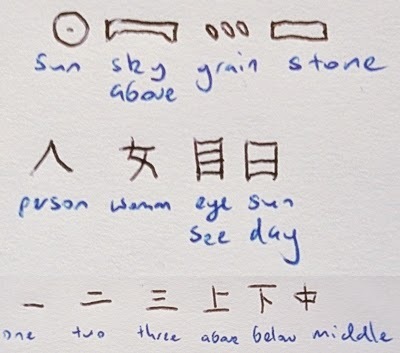 Today we will be looking at doing the same with the written representation of a language, in other words developing a writing system. Now there are a number of systems for writing down a language, there are consonant alphabets, phonemic alphabets, syllabic alphabets, and semanto-phonetics. Consonant alphabets typically have letters for consonants only with diacritics which indicate vowels. For example below you can see the consonant letters in black and the indicator of the vowel in blue. Phonemic alphabets have letters that represent both consonants and vowels often with specific combinations of the two represented as well. Syllabic alphabets main element is the syllable and these are typically made up of consonant and vowels. The final writing system is the semanto-phonetic these are made up of symbols. They can be pictograms which resemble the things they represent, logograms which represent parts of words or whole words, or ideograms which represent abstract ideas. Now just like with the language base you want to choose a writing system which is fitting for your people, so as a rule I will pick a system from a language which is related to the one I used as my language base. 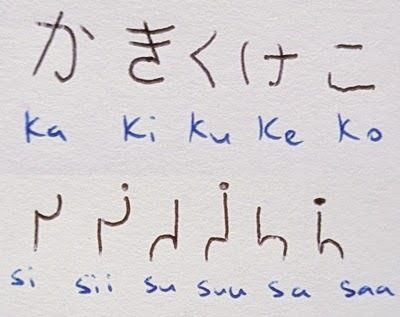 Once you have chosen you can begin to manipulating the writing system to work with your language changing aspects of it from the physical letters to the way they are written down, right to left, left to right, vertically, or horizontally. So you have your language sorted from its pronunciation to its writing but what if you want to have your own subsets, people who speak a slightly different dialect or an altered form of it, do you want to track your language through the ages. Well next week we will look at how you can create several languages from your main language and how to do so in a realistic way.